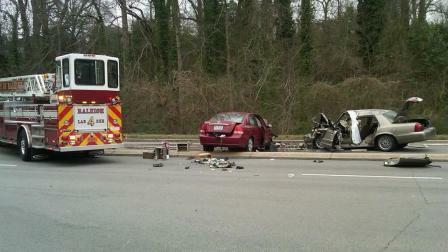 Two people were killed and another injured on March 17, 2013 in a wrong way collision in Raleigh, North Carolina (NC). The accident occurred on Wade Avenue, when according to witnesses; the driver of a red car drove the wrong way in the east bound lanes and collided with a gold car. The driver of the red car survived the crash and was taken to Wake Med with serious injuries. Police state they will charge the driver with drunk driving, driving while intoxicated upon his release. The two victims killed traveled in the same car. This picture was taken at the scene of the Wade Avenue accident. It’s saddening to hear of two innocent people tragically killed by a drunk driver. St. Patrick’s Day is the holiday most associated with drinking and unfortunately many of those who celebrate negligently put others at risk. Authorities say there is a dramatic increase of alcohol-related incidents on St. Patrick's Day each year. The National Highway Traffic Safety Administration says on St. Patrick's Day in 2009 37 percent of drivers involved in a fatal crash had a blood alcohol level of .08 or above. Many of these drunk driving cases are not as simple as some attorneys may think. If the defendant was drinking, where did he get the alcohol? If he was at a bar and they continued to serve him alcohol when he was visibly intoxicated, the bar may also be negligent and liable. People who have suffered a wrongful death in a car or truck accident caused by alcohol or drug use should understand the importance of seeking damages from every potentially liable party. It’s important to obtain representation from a North Carolina (NC) wrongful death lawyer that is not afraid to aggressively fight for their clients. Contacting a North Carolina (NC) wrongful death lawyer quickly will allow for the attorneys to have the most time to gather evidence to compile a case and be fully prepared when the family is ready to pursue a wrongful death claim.